Update: Respawn has given us a much better, more complete look at Apex Legends' new Havoc rifle with an in-depth gameplay clip, embedded below. Besides its flashy, rapid-fire plasma bullets, the Havoc is unique in that it can accommodate two hop-up attachments. The Selectfire Receiver makes it possible to fire the Havoc's charge beam for massive, pinpointed damage, while the Turbocharger eliminates the short spin-up time before you can autofire. With both attachments equipped, the Havoc will have amazing utility in both long-range and close-up engagements. It'll go live later today, so keep an eye out for any Havoc rifles as you explore King's Canyon. 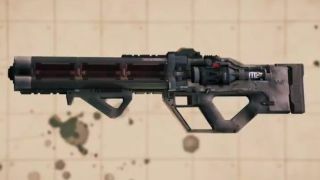 Now, if you haven't been scouring the 'net for Apex Legends news, you might've missed that this gun was leaked by dataminer Shampooh last week. Suspected to be named Havoc - which lines up with the teaser text in the Tweet - this looks to be a futuristic assault rifle that uses energy ammo (the yellow kind, if you prefer color coding). The clip shows a very fast rate on fire on the Havoc rifle - but may also reveal a crucial detail about an alternate firing mode. It's suspected that the Havoc will also have a charged-up rail shot for huge damage, which could be made possible by a specific attachment (similar to the Prowlers' rare Selectfire Receiver attachment). In the last second of the chopped-up footage, you can see the weapon charging up a big blue pulse of energy at the end of the barrel, which is likely milliseconds away from absolutely demolishing the poor enemy in the crosshairs. If the Havoc works as dataminers advertise, it could shake up the Apex Legends meta and make energy ammo highly valuable even if you aren't rocking the Triple Take sniper rifle or Devotion machine gun. We'll find out for certain how the Havoc functions when it hits Apex Legends tomorrow, February 20. Apex Legends also just got a Twitch Prime pack with a thicc Pathfinder skin, here's how to claim yours.